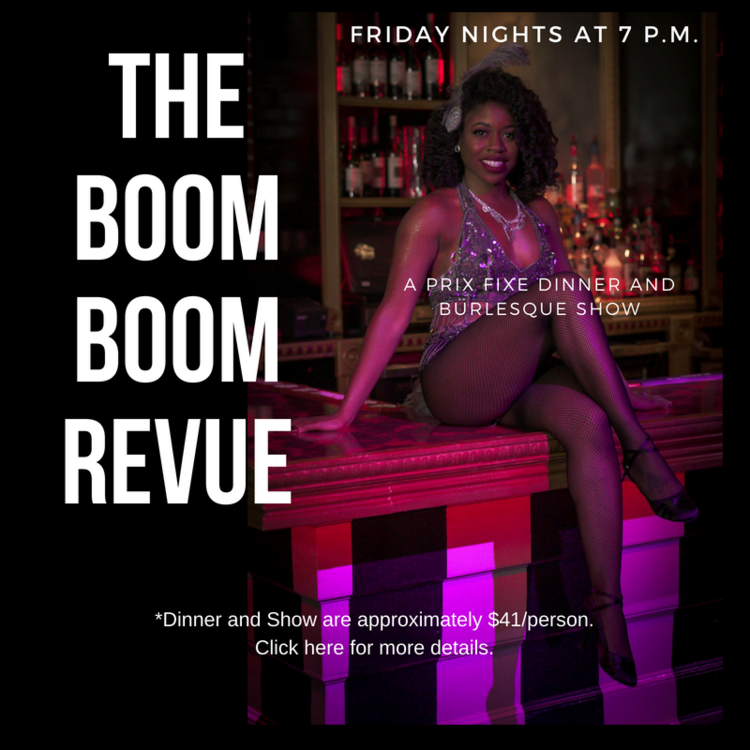 THE BOOM BOOM REVUE DINNER SHOW FRIDAYS AT 7 P.M. Doors Open: Fridays at 6:00 P.M. When Does The Show Start: The dinner portions starts around 7 P.M. and as soon as the last pastie is secure, and the feathers are in place, usually around 7:30 P.M. the show starts, so be patient, keep eating and drinking, and enjoy the night. The show ends between 9:15 P.M.-9:30 P.M. Description: Looking for a night of fun? A great place to take your date? A fun girls’ night out? Welcome to the home of St. Louis Burlesque!!! Join us Friday night for a dinner show like no other!!! Imagine this, you enter through the red velvet curtains, anxious and ready for a fabulous time. You peek around the way and notice a beautiful bar with lots of options to choose from. You then notice the gorgeous decorated room that’s just the right size, intimate and cozy for the show you’re about to see. You are taken to your table that was reserved just for you, and your name is even listed on it because you prepared and purchased your tickets in advance. You hear fun music with a vintage touch, laughter from other guests around you, and you smell a delicious aroma of the dinner you will soon be served. A server greets you and shows you the cocktail menu. You delight as you notice our specialty drinks are named after fun playful ideas. Around 7 P.M. the first course is served. Drinks are flowing and around 7:30 P.M. you’re ready for the big event. It’s time to start the show!!! The Boom Boom Bombshells will dazzle you with their teasing moves. Our hostess with the mostest will keep you laughing all night long. It’s a night of great food and fun that you won’t want to miss.